Wayanad, February 17: Union Tourism Minister KJ Alphons had to delete one of his tweets after he was slammed by netizens for posting a selfie with the coffin of a CRPF soldier killed in the Pulwama terror attack. 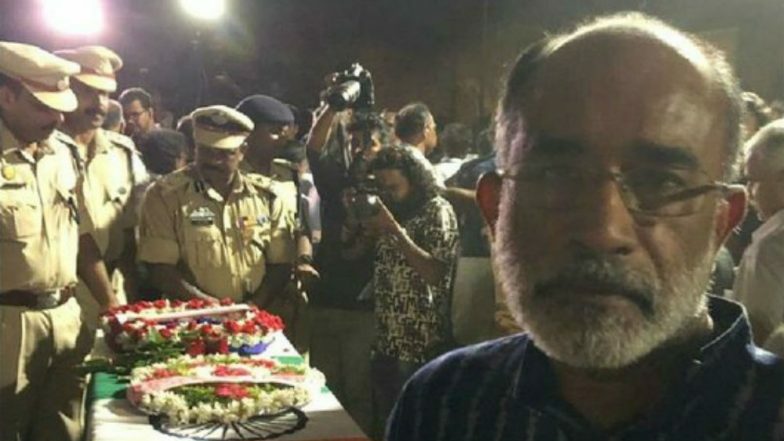 Alphons was trolled on social media for the selfie, with several users accusing him of indulging in 'blatant self-promotion' in the back of a tragic incident. Following the online outrage, Alphons deleted the tweet containing the controversial selfie. Alphons clicked a selfie with the coffin of martyred soldier Vasantha Kumar when the late soldier's body was brought back to his residence at Lakkidi in Kerala's Wayanad district on Saturday. "The funeral of CRPF jawan Vasantha Kumar is being held at his home. It is because of people like him that you and I can live peacefully," the union minister wrote along with the selfie. The tweet didn't go with netizens who slammed Alphons. Pulwama Terror Attack: How CRPF Jawans Fell in JeM Trap. "Sir, you should have used a better camera for this selfie, can't see the shame on your face," said a netizen in response to Alphons's selfie. Another user took on the Bharatiya Janata Party and said that this "was not the time for drama". Another claimed the union minister's act was a testament to his narcissism. After facing flak, Alphons deleted the tweet. Pulwama Terror Attack: India Strips Pakistan Of MFN Status. Thousands of people from various walks of life turned up Saturday to pay homage to Vasanth Kumar as his mortal remains were brought here for last rites. The martyr's body was received at Kozhikode Airport by Alphons, state Ministers EP Jayarajan, AK Saseendran and KT Jaleel and several lawmakers. After a guard of honour at the airport by the Central Reserve Police Force, the body was taken in a motorcade, with Alphons and Saseendran leading it. The convoy stopped at Kozhikode where hundreds were waiting on the roads to pay their last respects. Vasanth Kumar's body was taken to his home and then to the LP School at Lakidi, where thousands waited for long to have the last glimpse of the martyr. Later, the last rites were held with full state and military honours at the family cremation ground.